It’s the word that our clients least want to hear uttered from the mouth of their vet. And the word that we as vets dread having to use. However cancer it is certainly not defined as ‘the end of all hope’. Often there are options to help bring relief and quality of life for your dog ongoing. Cancer is basically a process that occurs whereby cells replicate and grow abnormally. This results in tumours, which are abnormal growths of tissue. These growths form a swelling or lump. If the lump is ‘Cancer’, it means it is malignant. A malignant growth is one that tends to invade the tissues surrounding it and spread to other parts of the body. This is cancer. You may hear the term neoplasia. Neoplasia just means ‘abnormal growth of tissue’. It may not necessarily be cancerous growth however (eg. a benign cyst is a neoplasm), but it generally has no potential to spread and is therefore not cancer. Metastasis basically means ‘spread’. If a tumor has metastasised, it has spread to another organ or part of the body. Epithelial, eg cells from the skin and glands. These cancers are called ‘carcinomas’. Mesenchymal eg, fat cells, bone cells and cells that make up fibrous and scar tissue. These cancers are called ‘sarcomas’. Round cell eg. cells involved in immunity like macrophages and mast cells. These round cell cancers have various names, for example lymphoma, mast cell tumor. Environmental/ external causes. For example, we know that UV Rays can cause melanomas and cigarette smoke can cause lung carcinomas. Obesity, exposure to carcinogens (substances that increase the risk of cancer eg. Asbestos, some insecticides, lawn care products), some viruses and diet are other examples of external factors. However these factors won’t cause cancer in every patient exposed. Therefore, internal factors also play a role. However, environmental factors are the most important and the most common cause of cancer. Internal/hereditary factors. this is basically to do with the genes that make up an individual. 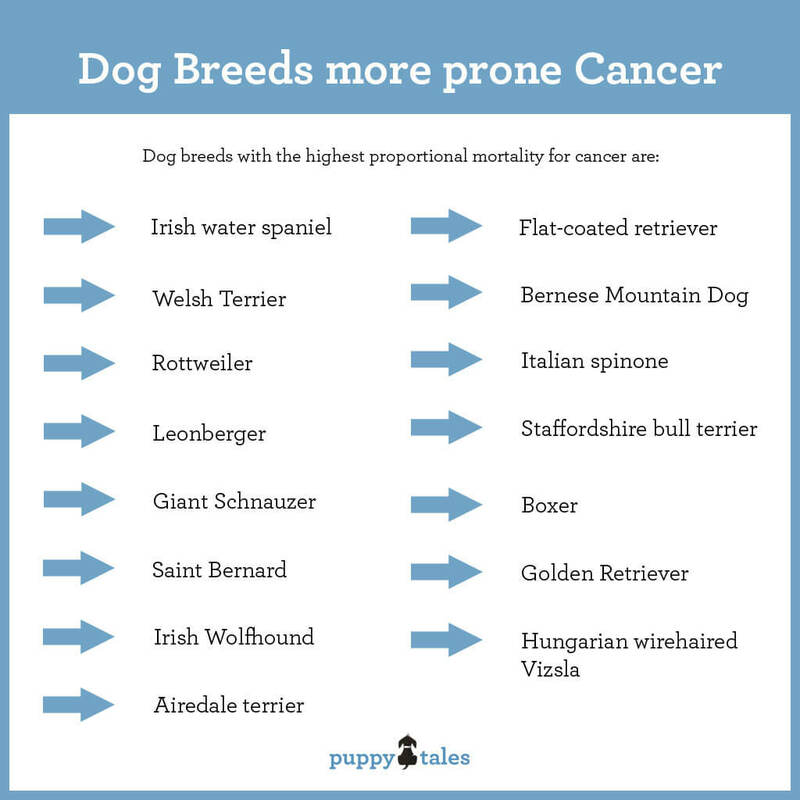 This explains why some breeds of dog are more prone to different kinds of cancer (see below for breeds more prone to cancer). Unknown factors. Sometimes there is no data available about the likely cause of the cancer. Millions of dollars of research goes into trying to ascertain these unknown factors every day. The more we know about the causes of cancer, the easier it will be to find cures. 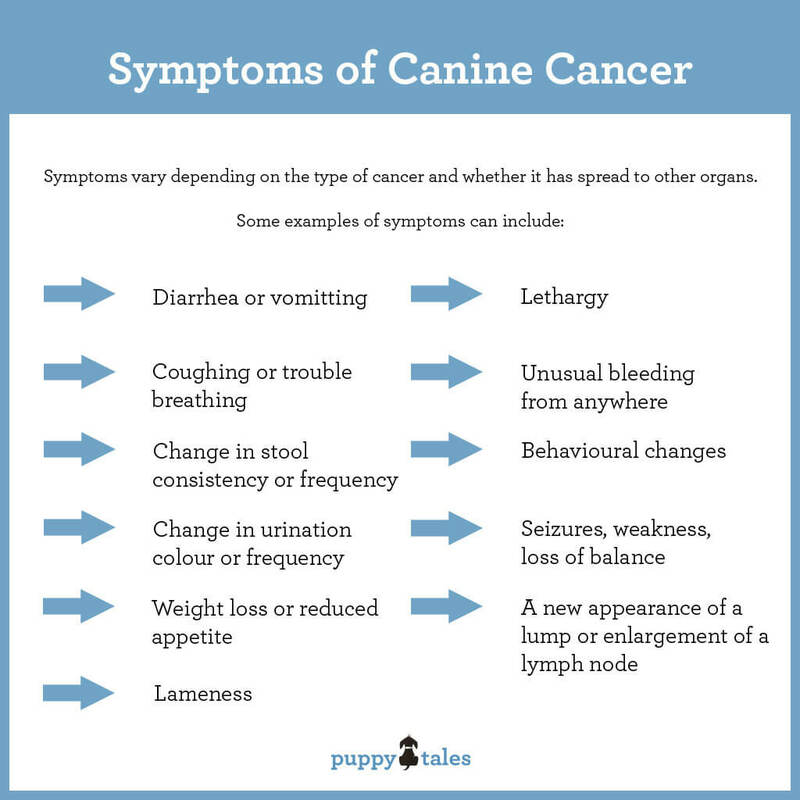 What are the signs/symptoms of cancer in dogs? There are some very generalised rules of thumb for whether a lump is malignant (cancerous) or benign (eg, fatty lump, cyst, skin tag). These rules don’t apply in every case and if in any doubt have the lump checked by a vet. Note ­ some cancerous lumps will still have the above criteria. One such example is a mast cell tumour. These lumps can have many benign characteristics and yet they are cancerous and should be removed surgically asap. Is cancer painful for dogs? This is a very commonly asked question and the answer is ­ it depends on the type and location of the cancer. We can often extrapolate from humans as to what cancers are the most painful. It is very important to remember that it is in a dog’s natural instinct to hide pain, and if I am ever in doubt about whether a dog is in pain, I treat as if it is. Sometimes just monitoring the response to pain killers can be a good way of ascertaining how much pain your dog is in eg. If you notice a big response to pain killers (ie improved demeaner, appetite, mobility etc) then they were probably in significant pain! The moral of the story is ­ dogs can’t talk ­ if in doubt about pain, treat for pain and monitor response!! Signs your dog is in pain can vary significantly. A very subtle behavioural change, mild lethargy, reduced activity level, reduced appetite or a slightly increased respiratory rate could all be signs of pain. Dogs in pain certainly won’t always let you know in an obvious way such as by yelping. A pain protocol should be part of the treatment for any of our canine patients with cancer. Treatment depends on the type of cancer, the location of the cancer and whether the cancer has spread to surrounding lymph nodes, organs or other parts of the body. Treatment can be divided into surgical and medical. If the primary (first) tumour has metastasised (spread), then removing just this tumour surgically is often fruitless. However, if detected early, surgery is often the best option and can even be fully curative! It is very important before your vet attempts any surgery on your dog, to know what type of cancer they are dealing with. This is because a benign tumour such as a cyst, can be resected with very small margins, whereas with a cancerous lump, you want to take a wide margin of normal tissue as well as the obvious lump. If the tumor is located within a body organ, for example the bowel, an adequate section of normal appearing bowel also needs to be resected.Without knowing what the cell type is prior to surgery, you may not take enough tissue only to find out after the fact that the lump is cancerous and not benign. A repeat surgery is often not as successful as if you were to remove the lump with wide margins on the first attempt. The moral of the story is always insist your vet does a biopsy prior to any surgery so they know exactly what they are dealing with! Analgesia/pain relief (discussed under ‘is Cancer painful’). The main two modalities used to modify the growth of tumours is ‘radiation’ and ‘chemotherapy’. It is very important when considering chemotherapy in dogs, to realise that the goal of treatment is often different. What I mean by this is with humans, the goal is often longevity of life, and major side effects are tolerated by the individual to achieve this. This is not considered ethical when treating animals and so the goal is always ‘longevity AND quality of life’. For this reason, the doses of chemotherapy and radiation that are given are often much lower than with humans. This is why, for example, your pet won’t lose their hair with most chemo protocols. The first thing that often puts clients off chemotherapy is the connotation of severe side effects. It is important to emphasise that this is not the case in the animal world. It is still a big step to decide whether chemotherapy is the right choice for your pet. There can still be some side effects and often it is expensive and requires multiple trips to the vet hospital and multiple blood test check ups. Some canine patients are not in the least bit stressed by all of this (most Labradors are happy to exchange a bit of blood for a liver treat! ), however other dogs find the constant trips to the vet very anxiety producing and this may make you question (reasonably) whether the pros outweigh the cons. The prognosis for cancer very much depends on the type of cancer, the location, whether it can be surgically resected and whether there has been metastasis at diagnosis. The prognosis can literally vary from ‘completely curative’ to ‘hours to live’. Once the cancer type and location have been defined and the dog has been ‘staged’ (process of looking for any signs of spread), your vet can often look at case studies of other dogs and give you a ‘mean survival time’. ‘Mean survival time’ (MST) is defined as the survival time of the patient in the middle of a group. Eg. If the mean survival time is 12 months, then half the dogs would have died at some point before 12 months and half the dogs would have died after 12 months. However it gives you a rough idea of what you may expect and is often used to compare treatment options. For example: MST with pain relief only is 3 months, MST with surgery is 6 months, MST with chemotherapy and surgery is 12 months. Are some breeds more prone to cancer? The answer to this question is certainly yes. However, this is not necessarily a reason to avoid a cancer­prone breed. As obvious as it sounds, we all have to die of something, and the same is true for our doggie friends. Some breeds are not prone to cancer, but instead develop congestive heart disease or debilitating arthritis. However, it is still important to know which breeds are potentially more prone so you know to be especially diligent in detecting the symptoms discussed above. The following provides a breakdown of some common cancers, and the breeds that are potentially predisposed. Osteosarcoma: Almost exclusively the larger breeds of dogs such as Rottweilers, Great Dane’s, Irish Wolfhounds, Greyhounds and Saint Bernards. Dermal form is more common in breeds with non­pigmented skin and light hair coats. Sunbathing of these areas increases the risk. Mast Cell Tumors: Boxers, Bullmastiffs, Boston terriers, Staffordshire bull terriers, Rhodesian Ridgebacks, Pugs, Weimaraners, Labrador retrievers, Beagles, Shar­Peis and Golden Retrievers. Lymphoma: Boxers, Bullmastiff, bulldog breeds, Basset hounds, St Bernards, Scottish terriers, Airedale terriers, Bouvier des Flandres, Labrador retriever, Rottweilers. English springer spaniels, Cocker spaniels, Setters and German shepherds. Melanoma: Most common in dogs with heavily pigmented skin. Schnauzers (mini and standard) and Scottish terriers are over­represented. Oral form – Dogs with pigmented oral mucosa. Cocker spaniels, Poodles, Chow Chows, Golden retrievers and Pekingese are over­represented. Mammary Tumours: Poodles, Spaniels (cocker, English and Brittany), English setters, Pointers, German shepherd, Maltese, Yorkshire terriers, Dachshunds, Dobermans, Boxers, and Beagles. Dobson, Jane, M. (2012) ‘Breed­Predispositions to Cancer in Pedigree Dogs’. ISRN Veterinary Science, Volume 2013, Article ID 941275, 23 pages.